What was your very first gig? "We had this little bedroom band going and my friend's mum, who used to work for Social Services, said,'Come along, you can play for the old people.' So we actually did an old people's home, playing Eric Clapton songs to a bunch of bemused old people. They seemed to like it." "It's just my old Marshall Jubilees, any cab with Vintage 30s in, my pedal - the Phil Hilborne Fat Treble Booster - a bit of delay, wah-wah and a volume pedal. But I have got a small rack, which I use for any foreign stuff and for Champions Of Rock. "We travel light on that because it's all fly gigs and stuff. So, for that, I just use a 40-a-side power amp and a Marshall JMP-1. Then there's my red PRS [Signature] and I'm using the blue [Signature] quite a lot, because it's big and fat. I've got a black one, as well. It's got 10s on it - really nice and loud! In the studio, it's a Two Notes Torpedo Studio and the Marshalls." What piece of gear is essential to your live sound? "It's your fingers! I'm sorry, but it's right. I do think that's where it begins - it has to, doesn't it? But other than that, I guess it's got to be the amps, the Jubilees. I love them. It was one of the best Marshalls ever made." "My man bag. If that's not a good enough answer, then it's something to make you go to the loo and something to stop you from going to the loo. I carry both with me, I think every sensible person does. There's nothing worse than having the trots before a gig. The gig's got to go on, irrespective of your bowel movements." What's the nearest you've come to a Spinal Tap moment on tour? "I went down to do the solo from Bohemian Rhapsody at The Dominion Theatre in front of 3,000 people - big entrance, smoke and lights - but the DI box had been set to the wrong impedance. So instead of it roaring with gain, it sounded like Hank Marvin. It was as clean as a clean thing could be. So I'm standing there and I wanted the ground to swallow me up!" "We're actually quite conservative, because I just want something to drink and something to eat. Quite boring, really. There's one thing I wish wasn't on the rider in Sweden and that's Dauphinoise potatoes. You get them at every single catering and every single gig. I know it sounds bad, but it's not good for you and there's tons of it." What's the best venue you've played in, from a musician's point of view and why? "One of the most recent venues I enjoyed was the Ericsson Globe in Stockholm. It was huge, just massive, amazing. All the people were holding their phones up and you feel loved. It's one of those times when you feel privileged to be doing what you're doing. You think, 'God, this is good…', you know.' I want my friends to see me now!'" What's the worst journey you've had to or from a gig? "Playing in Braintree and then going up to do the Scottish Guitar Show at the SECC in Glasgow, finishing that and then thinking it would be a good idea to go to dinner at a hotel by Loch Ness and drive home. "So I'd driven to the gig in Essex, done the gig, driven to Scotland, got there in the morning, soundchecks and all that, did that gig, went off and had something to eat, drove all the way back to Carlisle and at that point, I couldn't do any more. "So I said to [bass player] Andy Frost, 'Would you mind taking over?' I woke up some hours later and the van was pulled over to the side of the road and Andy was asleep. We'd only gone about 15 miles from when he took over!" Which airline, from a musician's point of view, do you find easiest to travel on? "My favourite airline is Air New Zealand because they're great, but I haven't actually had that much of a problem with airlines, generally. If you kick up enough fuss, then they'll generally let you on and find somewhere for your guitar, like a cupboard or something like that. But if there are overheads, they should let you take it on anyway. I think now they have to anyway, don't they? In America, anyway." What's the best tip for getting the audience on your side at a live gig? "I see a lot of guitarists who turn one side to the audience, like they're hiding. You've got to be, 'I'm here! ', especially when you're on massive screens each side of the stage - you can't hide. It's got to look good and sound good." 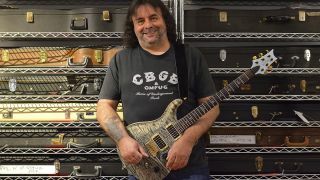 "I just play things that are going to be tricky on the gig for me, just go over them repetitively and get a connection between me and the guitar. I used to be able to wake up in the morning and go straight at it, but I've got to warm up a bit now."